Our Top Ten Dressage Test Tips for ensuring success at your next dressage competition. While riding around the warm up and dressage arena stay on the rein that you will follow once you enter. For example, if the test asks you to turn right at A, maintain the right rein until the judge signals your entrance. This will keep the horse thinking ‘right’ and will make him less likely to wander off the centreline. You are allowed to ride around the outside/inside of the dressage arena for a short while before you begin your test. The judge will sound a horn or ring a bell to tell you to start and you have up to 45 seconds to make your way around to A. Than usual when trotting down the centreline. This will prevent your horse from wandering and wobbling. And look confident in the judge’s eyes. It will enhance your image if you appear happy, no matter what happens and against all the odds. When riding circles, try to make a ‘diamond shape’. This will ensure you meet all the right points on the arena while maintaining the correct bend. Demonstrate a clear difference between riding loops or circles and when riding the corners, make sure you ride the corner as deep as you can. Perform your movements exactly at the letter. Keep circles as circles and not as squares or ovals. 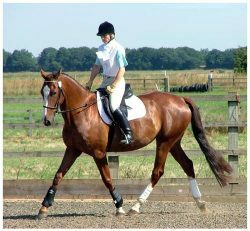 The judge will be impressed by accuracy and shouldn’t mark you down too much if your horse’s paces are not as good. Half halt to balance the horse two or three strides before the transition. Keep him balanced and on the bit for a smooth transition. When lengthened strides are required, extend your horse’s strides and don’t rush them. You won’t be able to fool the judge if you run instead of extend. A slow and well-balanced pace is better than a clumsy, rushed extension. When the test says ‘walk on a long rein‘ do not drop your contact completely. It doesn’t say ‘walk on a loose rein’. Keep a contact and encourage your horse to stretch down by discreetly sponging the reins. Visualise your favorite dressage rider. Keep an image of him or her in your mind while you ride your test. It may surprise you how close you’ll come to imitating them. Complete your test with a good square halt, a wide smile and a really positive salute. Even if you feel you’ve made a complete hash of it, this small gesture will gain you the judge’s respect and their marks may just reflect your positive attitude.